Handy Equipment Tool Manager for Windows, frequently asked questions. Is there a limit on the number of items we can catalogue? There is no limit on the number of items, borrowers, or places you can catalogue with our database system. Our application is ideal for inventories with up to 20,000 items. Not sure how to start? We are here to help you find what you are looking for. 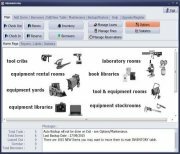 How to manage your equipment and tools with our software? Track unique, inventory, consumable items. What would be the cost for 1000 labels?